The Most Notorious ESPN Personalities... are they really worth it? The Most Notorious ESPN Personalities… are they really worth it? It’s been a busy couple of weeks for the human resources department at ESPN as a tidal wave of suspensions have rocked the network. In additions to the suspensions of Stephen A. Smith, Dan Le Batard, and Max Kellerman, other controversial Bristolites have found their way into the headlines for loutish remarks. As we are in the middle of FS1 Week at Awful Announcing and analyzing the first year of the newest cable sports network, it got us thinking about Fox Sports 1’s hopes of building an ESPN alternative and the desire existing among sports fans for one. We, like a lot of you, have a love-hate relationship with ESPN. While there is a lot that the network does that is excellent (30 for 30, World Cup, College GameDay, evening SportsCenter, PTI, live sports events) there is also a lot the network does that is atrocious (First Take, Embrace Debate, morning SportsCenter, only cover the big markets/stars, TebowMania). On the latter side, there are plenty of sports fans that have turned off ESPN for everything but the games because they can’t take the daily echo chamber anymore. Specifically, the toxicity of some of ESPN’s on-air talent invites fans to seek out that alternative (whether FS1 is the answer or not is another matter). With these events in mind, we’ve collected a list of the Most Notorious ESPN Personalities and ask the question for each one – are they really worth the trouble to Bristol? You don’t get the nickname Screamin’ A without being notorious. Unbelievably, Smith has resurrected his career at ESPN for a second run at the network by doing the same thing he has always done – yelling louder than the person next to him. Incredibly, ESPN has invested even more in Smith than the first time he was at the network in the mid-2000s and Quite Frankly was cancelled. It’s not too uncommon to see him on ESPN and ESPN2 at the same time weekday mornings, which I like to call the Doomsday Scenario. 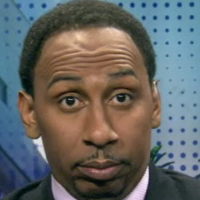 Smith has racked up the controversies and the critics since becoming Skip Bayless’ full-time professional arguing partner on First Take, undoubtedly the worst show in the history of ESPN. Denied saying the n-word on air multiple times… doesn’t get hockey… implied that women should stop provoking domestic assault… and then gave the worst Twitter apologies ever… one half of one of the worst duos in television history. What value does he bring ESPN? 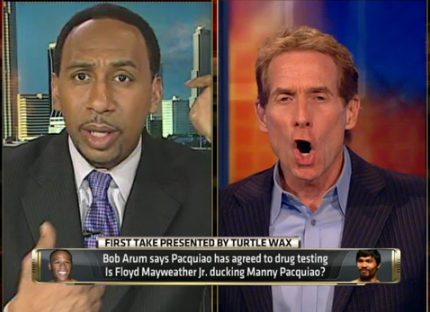 Somebody needs to be on camera with Skip Bayless and Stephen A is brave/dumb enough to be that guy. Also from time to time has some insight into the NBA and unlike others at ESPN, can express those insights in a VERY LOUD AND ANGRY VOICE! He was up until the Ray Rice fiasco as he was a key cog in the ratings and financial success that is First Take. Now, we’re saying he’s a bit too tarnished to keep trotting out there and there are plenty of folks at ESPN who feel the same way. Dan Le Batard likes to cause trouble. He has admitted it himself on multiple occasions and even said he was surprised at how many people backed him during his ESPN suspension because he’s used to being unpopular. His purpose as a sports personality is to graffiti the cathedral of sports that we take too seriously. Whether that’s making a mockery of his sportswriting brethren, getting rival fanbases to hate him, or just inflicting a little chaos, Le Batard thrives on antagonizing the masses. Note: above photo. Gave his Hall of Fame vote to Deadspin… trolls everybody at every waking moment… radio ranter and Miami Heat homer… suspended over recent billboard stunt. Le Batard has seen his national profile grow immensely with the addition of Highly Questionable and his talk radio show to the ESPN weekday lineups. His work with his father and Bomani Jones has developed into one of ESPN’s more enjoyable daily programs. One of the few people that *gets it* that sports are supposed to be fun. As long as his energy can be harnessed, he can be one of the most unique voices at a network in need of more diverse thought. Some of his intentional troll jobs are funny and make a satirical point about the daily sports conversation, but he should be careful to not push it too far and always insert himself into the story. Oh yeah. He rubs some the wrong way, but he’s low on the list of ESPN personalities you’d like to see get a pink slip. Plus he’s a dual threat between television and radio so it’s unlikely you’ll be seeing him go anywhere. In fact, you may be seeing more of him. Perhaps nobody at ESPN, not even Skip Bayless, has said more incendiary things in the last five years than ESPN Radio host Colin Cowherd. His broad, sweeping generalizations and self-anointed authority on understanding how society and the world-at-large works are often terribly, terribly misguided and leads to a disconnect with listeners. Thinks he’s always the smartest person in the room. Opinion guy. Blamed southern culture for tragic accident… won’t stop obsessively hating John Wall… said people in Ohio and Indiana are bringing unemployment on themselves… New Orleans basher-turned-biggest-fan… shut down a website out of sheer spite… gloated over Sean Taylor’s death. Proven to have the ability to retain a large audience on both radio and television. Has been getting more television work with a new Sunday morning football show at the expense of Outside the Lines. Has always been protected by Bristol, even when he crosses the line to say provocative things that get people talking/listening/watching with regularity. Unfortunately to some, this is a definite yes. Cowherd has held down the morning radio slot for ESPN for years, is a cash cow for the network with a large following and name recognition, and is someone they’d be hard pressed to replace. Darren Rovell may be the most hated man on the internet in sports, which is a little strange because he’s just a sports business reporter. In fact, the hatred for Rovell is SO STRONG on the internet that it’s almost startling. Rovell really isn’t the super-villain everyone makes him out to be. However, one can’t help but think there’s a part of him that enjoys playing the role of the unbeknown”Who, me? ?” heel and the way it impacts his #brand. Frequent Twitter feuder… very frequent, that is… suspended over mean tweet… tattled on college student… #brand. 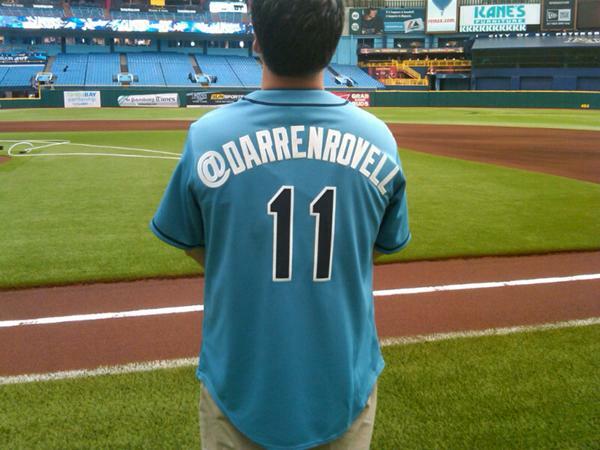 Rovell owns his corner of the sports world. Love him or hate him, he is the pre-eminent sports business reporter working today with the largest following by far. And even though they aren’t as vocal, there are those out there that appreciate his perspective. Rovell is a specialist, like a punter, kicker, or long snapper. Not one of your big stars, but a guy that has a specialty that few others internally can do. Name me an internal or external person who has the knowledge or presence to replace Rovell. He’s not going anywhere. CLICK HERE TO CONTINUE READING: The Most Notorious ESPN Personalities… are they really worth it?